On this night and the next day in 1942 in British Malaya (today’s Malay­sia) Japa­nese forces surged over and soon pushed the British-led de­fenders back to the edges of the 220‑sq. mile is­land of Singa­pore (the “Gibral­tar of the East”), nearly 600 miles from the ini­tial Japa­nese landing site. Singa­pore’s air­fields fell—they were diffi­cult to defend against attack—per­mitting the quick resupply of the Japa­nese in­vaders. Issued an ulti­ma­tum for the is­land’s sur­render on Febru­ary 11, Lt. Gen. Arthur Perci­val, land com­mander of Com­mon­wealth forces (British, Aus­tra­lian, and Indian bri­gades) that were holed up in the south­ern sector of the is­land, surren­dered his garri­son on Febru­ary 15. Perci­val’s troops, twice the strength of their attackers and recently rein­forced, were low on ammu­ni­tion and water. Many were tired from their retreat down the Mala­yan penin­sula, and many were inex­peri­enced and cer­tainly under­equipped. For in­stance, the British had zero tanks to the Japa­nese two hundred. Perci­val, who had only been in the Brit­ish colony six months, com­plained later that war mate­rial which might have saved Singa­pore was in­stead sent to the Soviet Union and the Middle East. During the course of the Japa­nese con­quest of Mala­ya and Singa­pore the in­vaders took some 130,000 Brit­ish, Austra­lian, and Indi­an prisoners into a bru­tal capti­vity; some stayed in Singa­pore at the infa­mous Changi Pri­son, but many were trans­ported in so-called “hell ships” to other parts of Asia, in­cluding Japan, to be used as forced labor. Some 60,000 Allied POWs were employed in building the infamous Thailand-Burma Death Railway between Bang­kok and Ran­goon (Yangon) in support of the Japa­nese cam­paign in Bur­ma (Myan­mar). Over 10,000 never returned. Brit­ish Prime Minis­ter Winston Churchill was appalled by Singa­pore’s sur­render, calling it “the worst dis­aster and largest capit­u­la­tion in Brit­ish history.” (A dis­aster on a sim­i­lar scale was taking place next door in the Amer­i­can Philip­pines.) Singa­pore’s sur­ren­der, just ten weeks into the Paci­fic war, per­ma­nently under­mined Brit­ain’s pres­tige as an im­peri­al power in the Far East. Perci­val sur­vived his cap­tivity in China and was on the USS Mis­souri in Tokyo Bay during the Japa­nese surrender cere­mo­nies in September 1945. He also was wit­ness to the Japa­nese sur­render cere­mo­nies in the Philip­pines with none other than Gen. Tomo­yuki Ya­mashita, reversing the role Perci­val had played nearly four years earlier in Singapore. 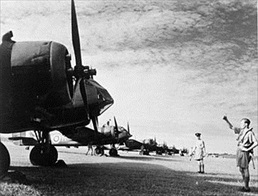 Left: RAF Bristol Blenheim bombers lined up at Tengah Airfield, Singa­pore, Febru­ary 8, 1941. The major airfield was impos­sible to defend, lying close to Japa­nese artillery across the Jahore Straits, the 1,100 yards that separated Singa­pore from the main­land. What is more, the British had less than half the 600 faster and more deadly planes the Japa­nese had. The enemy quickly domi­nated the skies, demolished air­fields, and destroyed the British and Australian air forces. 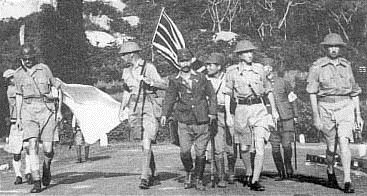 Right: Lt. Gen. Arthur Percival, led by a Japanese officer, walks under a flag of truce to nego­ti­ate the capit­u­la­tion of Common­wealth forces in Singa­pore, Febru­ary 15, 1942. It was the largest sur­render of British-led forces in his­tory and led directly to the im­pri­son­ment, tor­ture, and death for thou­sands of Allied men and women. 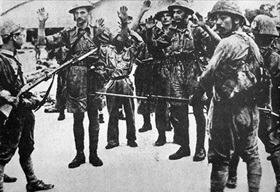 Left: Surrendering troops of the Suffolk Regi­ment held at gun­point by Japa­nese infan­try in the battle of Singa­pore. Men from the regi­ment suffered great hard­ship as pri­soners of war and only a few survived their captivity. 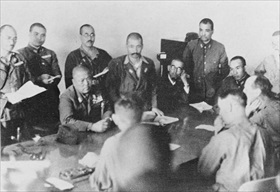 Right: Lt. Gen. Tomoyuki Yamashita (seated, center), the short, heavy-set, pudgy-face com­mander of the Japa­nese Twenty-Fifth Army, pounds the table to empha­size his terms—uncon­di­tional surrender. Percival sits between his officers, clenched hand to mouth. In Decem­ber 1945 an Ameri­can mili­tary tribunal in Manila con­victed Yamashita of war crimes relating to the many Japa­nese atro­cities in the Philip­pines (Yamashita’s last command) and Singa­pore (his first) against civilians and prisoners of war and ordered him hanged in February 1946. 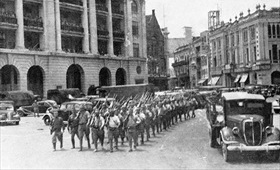 Left: Elements of the Japanese Twenty-Fifth Army march through Fullerton Square in the center of Singapore. The Twenty-Fifth Army served primarily as a garrison force for the occupied territories. 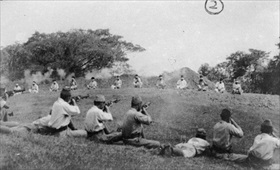 Right: Japanese soldiers shoot Indian (Sikh) POWs, captured Common­wealth sol­diers who sit blind­folded in a rough semi-circle about 20 yards away. This photo­graph was one of four found among Japa­nese records when British troops reentered Singa­pore in 1945. Japa­nese sol­diers sought ven­geance against huge num­bers of Chi­nese civil­ians who had settled in Singapore, executing between 50,000 to 100,000 young Chinese men, most infa­mously in the Sook Ching mas­sacre, which took place between Febru­ary 18 and March 4, 1942, at various places in Singapore and Malaya. Malays were not spared either.